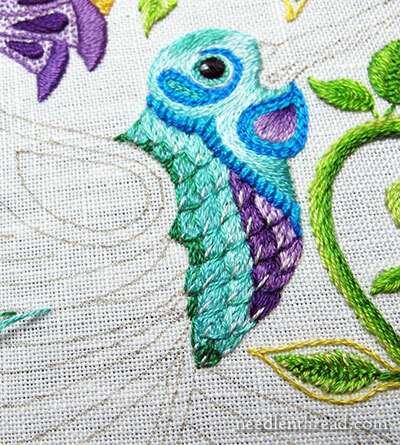 I’m still fiddling with embroidery stitches on the hummingbird. 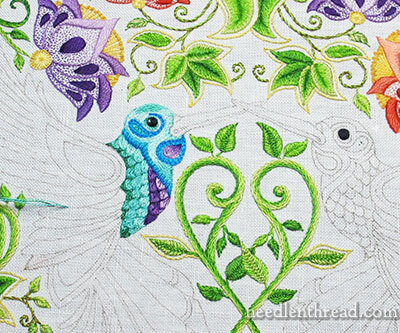 Last time, we chatted about the neck band and some textured stitching there, but I was still hemming and hawing about the embroidery on the bird’s chest, where the emerald green fly stitch outlines were bugging me. As usual, you’ve come through with lots of constructive criticism and suggestions! Today, I’ll show you where I’ve arrived and clear up a couple issues that keep coming up. 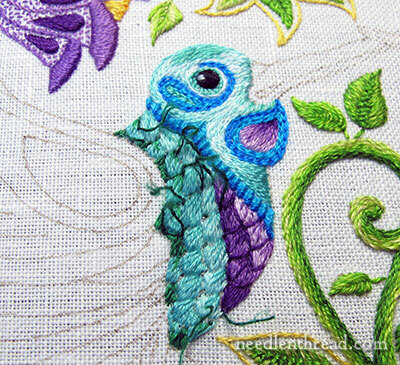 First off, the emerald green fly stitch had to go away. A few key but careful snips, front and back, and a little tweezer work took care of removing those stitches. Notice that I didn’t take the dark purple off. Once the emerald green was removed, I went through with progressive shades of the blue-green and replaced the outlines. This tempered the outlining quite a bit, and I liked it better. Then, just to test a theory I was discussing with someone, I went through with a very pale silvery-white, and tipped each “feather” with a straight stitch. A little more un-stitching, and out they came. Sometimes, you only know for sure if you try! Here we go. The straight stitches removed, the paler outlines in place. And there we are, in context with the whole piece. Notice that the feather “separation” is visible even from afar, but the contrast is not as stark. I will probably replace the dark line around the purple in the nearish future, but overall, I like this pretty well and will keep it for now. Many of you have suggested the use of metallics or blending filaments to add a touch of iridescence. This is a good idea, and for those who are adventurously working on their own versions, I’d suggest a thread like Bijoux or even Accentuate, both of which are fine enough for elements this tiny. I’m foregoing that option, because I set out on this project to work strictly with DMC floss, since most people can get ahold of it easily. The swashy thing under the beak on the hummingbird’s neck is most likely meant to be a very stylized gorget. On some hummingbirds, the feathers on the gorget look downright bumpy – almost like a small cluster of berries. On others, the feathers here are smooth and sleek and brightly colored. On some, the gorget is very noticeable; on others, it is more subtle or not there at all. There’s one variety of hummingbird that has a prickly gorget, with feathers that stand out almost like a porcupine’s quills. Whatever the case, the point is – and continues to be – that this is a stylized design. It isn’t meant to look like an accurate, real hummingbird. It’s also a design drawn by someone else, and already transferred onto the fabric. The swash remains, and for me, the colors work ok right now. If you don’t like it right now, your perspective may change once the beak is stitched and the rest of the bird is embroidered. Or you may never like it. And that’s ok, too! I like what you have done and as you say the contrast is not so dark and the paler outlines look much better. I’m glad you are resisting metallic thread as I am not fond of this thread, I used it once on a project and it is very awkward to work with. The swashy gorget is find and once the beak is embroidered I’m sure it will all blend in together. I can’t wait as you unveil the feathers and the delights in store for us as we turn the page of further thread delights on this project. Thanks for showing, sharing and helping us to have the confidence to rip and replace unwanted stitches, I hope you have a great weekend. I am really loving this project. I’m considering attempting it. It’s a bit intimidating though. Especially the transfer part. Wishing I had a pre-printed linen panel of this design! Hint, hint! I have to say that you have been very graceful in responding to some of the recent posts. Some of them have been downright rude! Notice how few of them are able to do what you have done. It’s easy to sit and criticize another person’s work. It’s easy to forget that Mary Corbet is a person with very real feelings. I think a little more respect and care in the way comments are worded could go a long way toward politeness when sharing one’s opinion. I, for one, know that I could not do what you do and I respect your work and your choices. Hi, Heather! Thanks for your comment! I appreciate it! Being a blogger for a while, I’ve learned a lot about online communication and especially how different personalities communicate. I don’t think that anyone who has commented here so far means to come across as rude – just frank, which is fine. I don’t take offense at frank comments. Malicious rudeness, yes, I find offensive, but I haven’t picked up on any intentional malice in any of the comments. You’re right – folks don’t always realize how their words can be taken when read, as opposed to heard or said in person. Online, they often write the way they would speak when chatting to people they know and who know them. But often, when we read the written word (as opposed to hearing the spoken word), we expect more diplomacy or tact, especially when coming from people we don’t know, whose personalities we aren’t familiar with. After all, someone who is writing can take time to reflect before sending out their words. But in this age of quick responses – where we are so comfortable communicating via social media, email, and the like – we don’t necessarily take time anymore to really reflect on the way our words can come across to those who don’t know us. Often, people don’t realize how they come across, so they don’t know that they need to “fix” anything in their approach. While I might be very blunt to my sister in an email or an instant message, knowing she wouldn’t see it as anything more than frankness, a very direct expression of an opposing opinion, or just a personality quirk that she’s used to, I wouldn’t normally respond the same way to someone I don’t know, because that person doesn’t know me, doesn’t necessarily know how to “read” me, and could take offense or have hurt feelings due to misunderstanding my tone. I know this, because I’ve been writing online for a long time, and I’ve learned it through making my own mistakes in communications. The thing is, we don’t often pause and think about it, when communicating via social media today. Understanding that this is the case, a blogger generally becomes immune to comments (or the wording of comments) that others might view as rude, tactless, “too” blunt, and so forth. So, while your feelings might understandably be shocked, hurt, or repulsed for my sake by some of the comments that are left on the site, please rest assured that mine actually aren’t! 🙂 I’ve learned to make allowances for social media communications, and for the various personalities of the many people who comment on the site. I don’t think anyone means to be directly unkind. They’re just offering opinions that were invited, and they’re being frank about them. And just as they can take or leave what I offer on the blog, I can take or leave their opinions. Either way, none of us should come away hurt by it. I often learn much from people whose comments can be taken as rude. If nothing else, I learn lessons in communications – often about what not to do! All that being said, there’s never a good excuse for direct rudeness or malice. When that happens on the blog or via email (it’s only happened a couple times), I ask the commenter to either address the issue politely (if it’s a valid one) via email, or simply to go somewhere else to read about embroidery. LIKE. Muchly. I think you hit it just right. I think your work is amazing and I would love to have the patience . 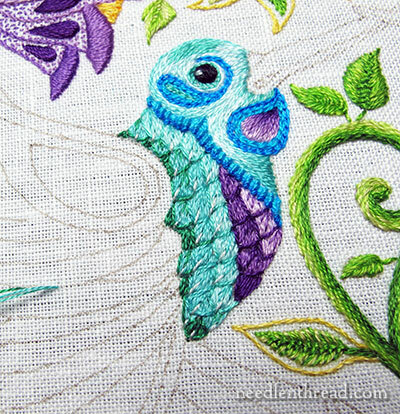 Even though I am doing much much simpler embroidery and textile projects I really enjoy seeing your progress and reading about the way you are thinking through each piece.I am doing a wee birdie at the moment, inspired by the birds I see in the woods, so enjoy seeing you progress with yours!It inspires me to continue ! Mary thanks so much for taking us on this journey and now I don’t feel half as bad about all my unpicking! I really love that you are taking us step by step through the stitching and choices that go into your work. It makes me understand that you have a very artistic approach to selecting colors and textures. Thanks again for sharing so much! Mary, your instincts are right once again. I liked the emerald green but it looks so much better without it. Heather is right, too, but I know with my own comments that sometimes I am blunt when I am merely trying to be brief. Dear Mrs. Corbet, I am going to miss the Emerald Green very much. That said, this looks just as lovely. Good call eliminating the silver stitches, I think that silver would be a great addition for the piece but not like that. I hope that it and the Emerald can return soon. Well, there’s still some emerald green in there Kristina – and it will probably show up in the wings or tail a little bit, too, though I’m still working through that. I didn’t much like the white-ish silver – but we will see! I know the Emerald Green is still there but I really loved the Fly Stitch a lot. I think the Pearl Gray could work as accents in the wings. Can’t wait to see the tail! Mary, watching you explore the possibilities in this piece has been very interesting. It’s so educational to see you try stitches and colors and then remove them, explaining why. I like that you’ve changed the feathers, which did look like scales. However, on my monitor the eye is a stark spot between the colorful flowers and the bright swirl below the eye. The top of the head is scarcely visible. Would you consider choosing some darker threads there, gradually getting lighter around the eye? That might help distinguish the top of the head from the white background as well as diminish the impact of the solitary black spot. Just a thought…. Hi, Sarah – yes, the lightness of the top of the head is on my mind, too. I plan to accentuate that at some point, somehow – probably with some extra shading in there. I’ll eventually tackle that! Thanks! this project is more exciting than any thriller I have ever read. 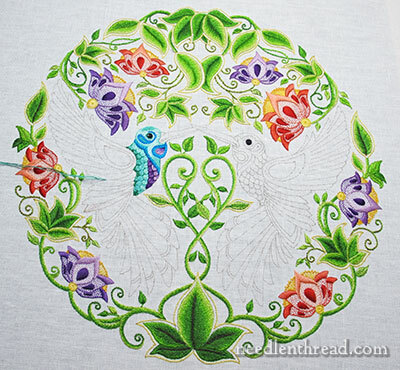 Can’t wait for the next twist, but I already see all the embroidery details singing in harmony. Thank you for sharing the great creative progress with us. Off now to attempt a Mary Corbet – have a happy weekend. Hi, Mariolina! Glad you’re enjoying it! I’m working on the tail this weekend. Hope to make good progress, with as little unstitching as possible! Which doesn’t sound all that encouraging for the immediate future. Yes, I recently noticed that, too. Very disappointing. I’m hoping Country Bumpkin will be distributing it here somehow. You might be able to buy it directly from the UK if it is reprinted there – maybe through Book Depository. We shall see. I am very happy that Heather addresses this question, I have great difficulty with English because the translation does not reflect my thoughts and I find myself abruptly. Result, I am discouraged, not to mention some girls that I find quite difficult. Be assured of my admiration for you as much, and exceptional daily work that you give us. I love following along as you think and experiment through a project. It really gives a great insight into the creative process. Quick question…you mentioned some possible picking out, but then stitched up against that same area. Does that create more problems for unstitching the first area…I’d think the new stitches would be entangled with the older ones and could be disturbed by the unstitching process. Thanks for all your great info and resources! Hi, Barbara – it doesn’t really cause a problem, as long as you’re careful when picking out the stitches. One thing that helps is that I keep each stitched area kind of autonomous – I start and end all my threads within that area, instead of running them under or wrapping them around the backs of other already stitched areas. I also cut the stitches from the front and back, and then just use tweezers to carefully remove all the cut threads. Good Morning Mary, Wow this piece is amazing and I really think I’m going to try it. The further you go the more amazing it looks WOW so, so much talent. You are absolutely an inspiration. Previous Previous post: What Was that Satin For, Anyway?